Casino Review - The enticing entrance to the Rushmore casino lobby is made spinning around a roulette wheel with realistic and sharp graphics. This online casino site offers both instant play and a download option. In addition, a fun mode of play is available for those who wish to practice their game skills or to play for pure entertainment. 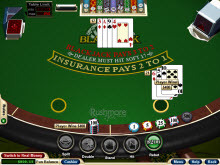 For the convenience of its players, the Rushmore casino offers a feature showing past transactions made at the site and also details of a player's personal game history. In addition to various promotions, this site offers a VIP club with special bonuses for the casino's loyal players. 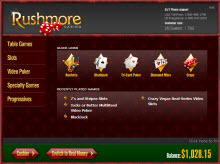 The Rushmore casino provides a preview of games, allowing players to view screen shots before selecting a game. Sophisticated encryption systems are used at the Rushmore casino to ensure the protection of transactions and information at the site. The Rushmore casino offers its players a range of exciting casino pursuits, attractive graphics, a variety of payment alternatives, promotions and bonuses and 24 hour support. Casino Bonus - An $888 welcome bonus at the Rushmore casino is split into two bonuses upon the first two deposits placed at the site. For the first deposit, players are offered a 100% match bonus worth up to $400. The 100% match bonus on the second deposit can earn players a bonus of up to $488. Software Provider - The software at the Rushmore Casino is provided by Real Time Gaming (RTG). RTG is considered to be one of leaders in the arena of online casino software and offers a reliable and trustworthy form of entertainment. Game Variety - In the majority of casinos, slot machines make up a considerable part of the gaming selection and in this regard the Rushmore casino is no different from the others. Rushmore features over 90 thrilling casino games that include more than 50 exciting slots. In addition to slot entertainment, the Rushmore collection includes other poplar attractions including blackjack, roulette, video poker and craps. It should also be noted that Rushmore also features progressive jackpot games including 'Let'Em Ride,' 'The Shark' and Shopping Spree'. Customer Support - players at the Rushmore casino may take advantage of 24 hour telephone customer support. Gamers may also contact support staff via e-mail and fax, in addition to consulting a section of frequently asked questions (FAQ) and answers at the site. It is recommended to consult the FAQ section first as in many cases a solution may be found before contacted support staff.